During a trip to the library, I discovered these little treasures illustrated in unusual and fantastic way. Illustrator Polly Borland has “captured” two books in particular that I find so cute and appealing to me that I have to share. I admit – I have a thing for miniatures that I think originated with my dollhouse that my Dad made for me. I’ve never done anything with this little fetish, though. Perhaps that’s because I know that it would end up being a costly venture and that I could also just live vicariously by seeing the work of others and simply enjoy the fruits of their labors. For me, a look through The Princess and the Pea is like sipping a tart pink lemon aid that is just sweet enough. The wit and humor of the writing coupled with the modern twist on vintage design paired with dollhouse settings and drawn faces is such a treat. What a lovely and fun mix if bright colors, comfortable old fashioned. 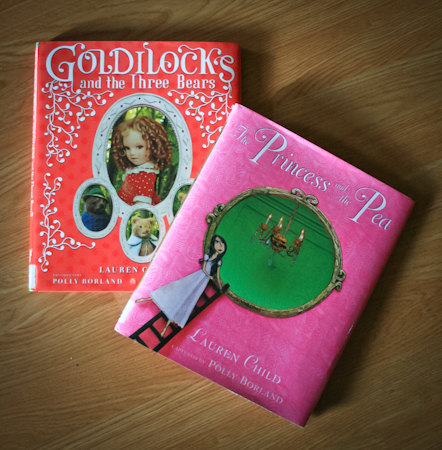 Goldilocks is illustrated differently and takes on a more sweet and innocent feel. Using a three dimensional doll, the lovely sets are set up in fresh colors. Yet the feel maintains some vintage form, which I love. I hope you enjoy a look at these two books, they’re lovely. If you’d like to see my other Children’s Book Recommendations, check out my Recommendations Page on Amazon. This entry was posted in Children's Book Review and tagged book recommendations, Children's book. Bookmark the permalink.